Buffalo wings get an upgrade with the addition of beer. Beer and hot sauce are simmered with garlic and butter for a rich, tasty wing sauce. Perfect for game day munching. In a medium sauce pan, whisk together, over medium heat, beer, buffalo sauce, butter, garlic, and sugar until simmering, about 4–5 minutes. Whisk cornstarch with ¼ cup of water and Worcestershire sauce. Pour in cornstarch mixture, and whisk until slightly thickened. Remove from heat, and set aside. Heat oil in a fryer or dutch oven to 350°F. Drain wings, and pat dry with a paper towel. Gently place wings in batches, in the fryer. Fry for 6–8 minutes or until crispy and cooked through. Remove from the fryer, and place in a bowl. 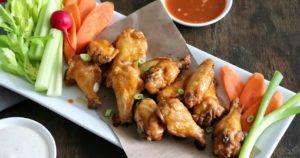 Toss wings with sauce, and serve with celery sticks, carrots sticks and blue cheese or ranch dressing. Tip: You can cook the chicken wings in the oven instead of deep frying. Preheat oven to 400°F, and cook for 12 minutes or until golden brown and cooked through. ****Don’t forget to snap a photo after you make and use the hashtag #SGPartners to get registered to win prizes. Follow our page to stay in touch.